This is the fifth volume in the book series Blur, which has already gathered over 1000 pages of writer artist editor teacher Stephen R. Bissette's reviews, interviews and insights on all aspects of cinema, DVD and video. Now make that over 1200 pages! And -- it's in Blog-O-Scope! 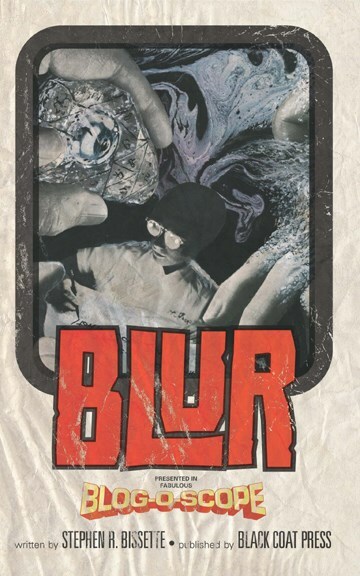 With this volume, Blur truly shifts into the 21st Century, collecting into book form the best of this award-winning cartoonist's tsunami of online essays and articles from 2005-2007. Whether rhapsodizing over a masterpiece like Guillermo del Toro's Pan's Labyrinth or Guy Maddin's Cowards Bend the Knee, savoring the genuine pleasures of home movies, or lambasting The Wicker Man remake or the encroachment of commercials into movie theaters, S.R. Bissette's Blur pulls it all together into an engaging, entertaining and intoxicating feast for movie-buffs, cinephiles and anyone who loves movies. This volume includes analysis of a previously undefined genre -- 'the awful place' cinema, including Silent Hill, Chain and The Decay of Fiction; European and Russian science-fiction movies of the 1960s and '70s (First Spaceship on Venus, Ikarie XB-1, etc. ); blistering anti-war films from Abel Gance's J'Accuse to Joe Dante's The Homecoming; George W. Bush-era horror movies, from notorious torture films like Hostel to real bone-chilling fare like DC 9/11: Time of Crisis and Faith in the White House; the 2006 Broadway revival of Sweeney Todd, Vermont's celebrated Ground Hog Opry stage show and the man behind it, and even the dream-inspired rant "Santo for President!" Also inside: reviews of The History Boys, Apocalypto, Children of Men, The Good Shepherd, and more, and of recent DVD releases of once-rare Mario Bava, Edgar G. Ulmer, Val Lewton, Hammer Films and Mexican horror classics; cutting-edge animation from Sally Cruikshank and anime based on Jim Woodring's celebrated Frank comics stories; rarities like Existo (The Forbidden Movie), I Was a Zombie for the FBI, Massacre, Satan's Children, The Descendant, Hintertreppe/Backstairs, and the delightful Ali Baba Goes to Town. Go to town yourself with this fifth volume of S.R. Bissette's Blur!